In fact, Unis had grown up around pianos. His maternal grandfather, Maurice T. Schuster, a violinist and piano tuner, owned Acme Piano Company in Sellwood and had played with the Portland Symphony Society for the 1937 President’s Dedication of Timberline Lodge at Mt. Hood. Schuster loved his grandson’s interest in pianos and coached him in the selection and restoration of worthy instruments — especially vintage names of the Golden Age. And for a brief time, Unis’s father had also run a piano shop on SE Belmont when he was just out of law school...before following his destiny as lawyer and judge...ultimately retiring from the Oregon Supreme Court as The Honorable Richard L. Unis. 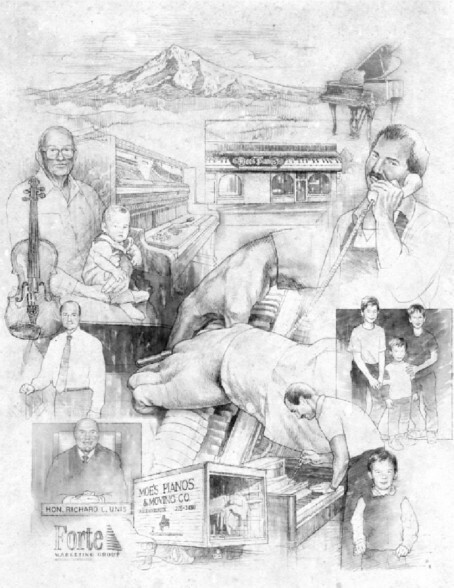 Moe’s Pianos became Portland’s most recognized name in piano sales and service in the 1980s, and Unis was often consulted by piano retailers from all across the country who wanted his expertise. Unis always claimed...about Moe’s back then and about Classic Pianos today... that there really is no secret: just give the buyer the widest possible choice, devote yourself to customer service, and be happy to take the same piano back on a trade-up — no matter how many years down the line. In 2001 Maurice Unis and his eldest son, Brian, opened Classic Pianos - next to the Aladdin Theater - at 3003 SE Milwaukie Avenue in a historic building that had earlier housed a violin maker. As soon as the shop was established, there grew up around Classic a very diverse community of piano-related businesses ― craftsmen and technicians dedicated to the restoration of fine old instruments, a piano moving company, and piano teachers working out of studios that had once been part of The French School. At the end of 2005, Classic acquired Cascade Music – Portland’s exclusive Yamaha dealership, a Hollywood District landmark for over 40 years. Maurice Unis closed Cascade’s business and consolidated his piano enterprise into his further- expanding Classic Pianos “campus” at the east end of the Ross Island Bridge. 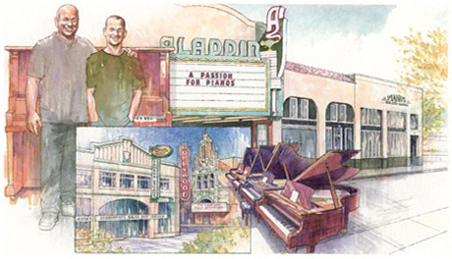 The expansion includes a newly remodeled, acoustically-enhanced, Recital Hall that occupies the space adjacent to the Aladdin Theater. 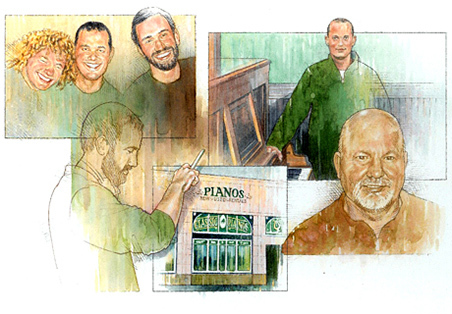 Continuing a fourth generation of dedication to the piano business, all three of the Unis sons have been involved with Classic Pianos of Portland. Brian, Maurice’s eldest son, is head of operations – having been raised in the “piano world” all his life and trained by his father in all phases of the piano business. Aaron, the middle son, was first schooled in the piano shop after graduating from University of Oregon - then headed up Classic’s Concerts & Events Division until January, 2008 when he left to take a teaching sabbatical in India. Taylor, the youngest son, while still in college, was first trained in inventory and floor arranging; also in piano moving and storage for A-Z Moving. Today he has joined the Classic team full time in selling and customer service. Then in February of 2013, when Sherman Clay / Moe’s Pianos decided to leave the Portland market, Classic Pianos was appointed as the official dealer for Steinway & Sons. “It was like a home coming!” said Maurice. But by October of the same year, Steinway & Sons offered Classic Pianos a continuing dealer relationship on the provision that Classic would become a Steinway only dealer. This would have meant that Classic Pianos could no longer represent Bösendorfer, Yamaha, Schimmel, Mason & Hamlin, Charles R. Walter, or other top names, that had catapulted Classic Pianos into its national, award-winning reputation — from where it had started as a Steinway dealer at the original Moe’s Pianos. After careful consideration, Maurice decided to give up the Steinway dealership effective December 31, 2013. Maurice concluded by saying that because of his continuing and abiding respect for Steinway & Sons instruments — especially vintage Steinways from the Golden Age of Piano Making — Classic Pianos will continue to offer elegant, restored Steinways as part of its Classic Collection.